“At the conference this spring, one of the Connections sessions is Web and Social Media Presence for Artists and Educators. This discussion session will be an opportunity to bring your experiences, questions and ideas to share, get ideas, and explore opportunities. Whether you have a strong online presence or aren’t sure where to start, my hope is for this session to have something for everyone! As for myself, I have largely focused on maintaining a portfolio website for the last decade, though in recent years I have been expanding my professional social media, mainly through Facebook, Twitter, and Instagram, as well as dabbling on Etsy. Some platforms have been more successful than others for me, and connecting with other artists through social media can bring surprising opportunities. Public art, when done well, contributes to a distinctive sense of place. Public art created by individual students, or teams of students, works to raise recognition of the arts both on and off campus. 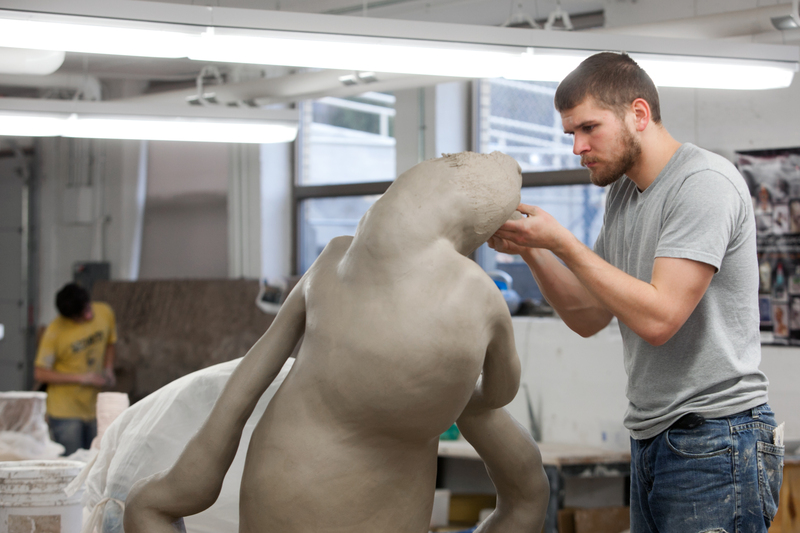 Public art courses provide students with significant real-world accomplishments. This discussion will be an opportunity for college and university art faculty to explore integrating public art into their curricula, or enhancing existing programs. How can a public art course help overcome declining financial support for the arts? In what ways does the course enhance a student’s professional preparedness? Where will the art be installed? Why? What is the impact on the aesthetics and culture of the selected venue – including campus? Who might be involved in the role of the client? Can their participation raise the profile of the Art Department? What media are appropriate for public art? How does space dictate scale? What are best practices in the process of planning and execution? Are there opportunities for developing resources for these projects? How do you add quality art projects to public buildings when funds for art are usually among the first to be sacrificed for construction changes? This certainly can be a dilemma. When confronted with the task of constructing a series of new residence halls on the campus of UW-Platteville the newly formed Real Estate Foundation was not thinking of art but of providing quality space that students would chose over other options. The focus was on the building and its function. However during the process the thought of a stark and bare building did not project the type of facility that students would want to choose. The solution, use student art from the University’s Art Department to produce art by students for students. In 2011 the Chair of Performing Arts, Dan Fairchild was approached with the idea. He quickly assigned an associate Professor Bruce Howdle to work with the Real Estate Foundation to see what might be done. Students were given the opportunity to present their potential works to the Real Estate Foundation along with Officials from the University and the Architect for the building. Nine very different projects were chosen. The projects ranged from normal size paintings and drawings to a Triptych with three 5 by 8 foot panels. Life size sculptures were created for the outdoor area along with a school of stainless steel fish to adorn the large retaining wall behind the building. 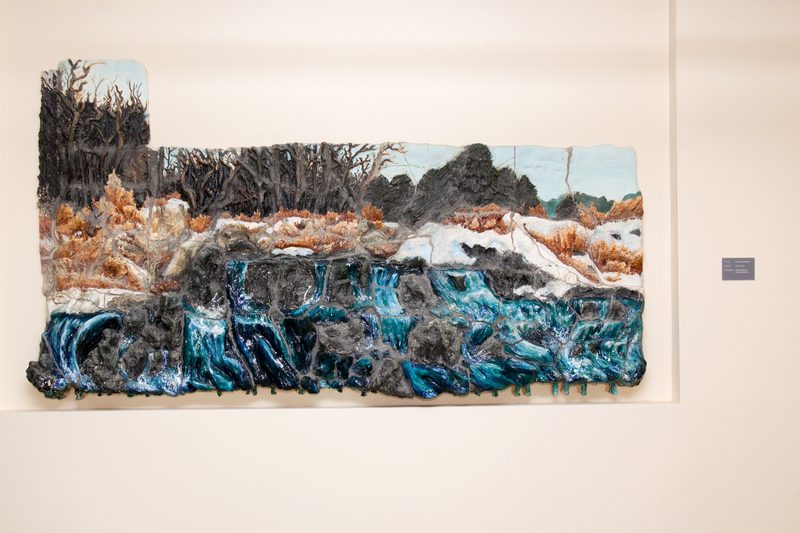 Two of the more interesting pieces are clay murals in the style done by Bruce Howdel. One mural holds a prominent space in the main lobby the other serves as a very large frame for a dry erase board in one of the buildings study spaces. At first there was some concern that the art pieces would be vandalized by students. The Real Estate Foundation took the position that if the students knew that the pieces were done by other students they would respect them and not want to damage them. So far the pieces have been very well received and respected by the students who call the space home. As time goes on more pieces have been added by new students and space remains for some more in the future. Funding for the projects came from multiple sources. To pay for the materials, donations were received from individuals and groups. A local manufacturing company donated most of the stainless steel used for the fish. An alumni group sponsored 2 large paintings. The project funded materials to include paint and canvas as well as concrete for one of the sculptures. Many special tools were obtained through a grant program that provided funds for students working with local businesses. The Art Department was able to keep these tools for future projects. The bottom line was the project was able to realize custom art that could be valued as much as $100,000 for only $2,000 from the project. Each student who worked on a project also gained valuable experience by taking the project from initial concept through to installation. The students had to keep to a strict time table to have the art installed by the time students would move in. To help facilitate this Professor Howdle devised a two semester course for public art. This allowed the students to plan the project and gather materials during the first semester then produce the piece and install it during the second semester. Only about half of the participating students were art majors who would go on to careers in art, but the lessons learned of how to take something from the beginning to the end and remain on a time schedule were valuable for all. When the Real Estate Foundation began its second project it seemed natural to follow the same course. A second Assistant Professor was assigned to add another art form. Carol Spelic who specializes in fabric art was added. Her students produced a large quilt made from old t-shirts that displayed various themes and eras from the University. Several new pieces were done for this new building and like the frist they are well respected and cared for by the students. If you need to provide art for a Public space remember there is a lot of new talent waiting to express themselves. You need only be creative in tapping this resource to provide a very cost effective means of keeping the arts alive.